Chose a plan that works for you and stick to it. Social media has a lot of positive and motivating influences, but not when it comes to training for 13.1 or 26.2 miles. Don’t fall into the trap of seeing what another runner is doing for mileage and think you should be doing the same. Have faith in your plan and work it each week, the way it was laid out, so you can avoid injury. Making it to the start line is the first goal. Every runner is different and you will not know how much mileage is manageable for you until you start building toward your race distance goal. Listen to your body and know yourself well enough to realize when you’re doing too much. One runner can achieve a PR (personal record) in the marathon with an 18 mile long run and 50 to 60 mile weeks while another can handle a 22 mile long run and 70 to 90 mile weeks. 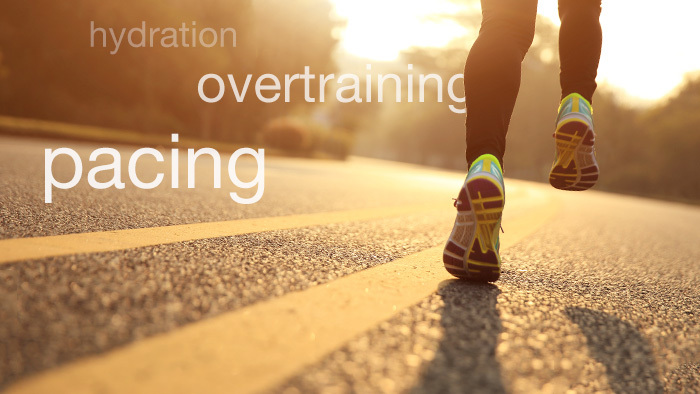 Both options are very effective and work for that specific runner. Do some experimenting to figure out where your high mileage threshold is and then stick to it. If you practice your race day eating and drinking during your training runs, your body and mind will be used to ingesting the specific food, gels and drinks you give it. Once you find food and beverages that work for you, use them throughout your training and do not deviate from the plan on race day. You may be tempted at the expo or at the race itself to try something new, but remember the golden rule- nothing new on race day! A half or full marathon is a major committment in your time and effort. Make sure you avoid these five mistakes to arrive at the start line ready to achieve your goals.